Hi there! Stopping in for a quick hello and a plum soda recipe during this long patriotic weekend. Lots of things to do! Wednesday morning can stay super far away from me. I have already consumed a hot dog and some potato salad, so I feel like I've fulfilled my American duty. I think this is my 4th Fourth of July in San Francisco and every single year it is cold. I'm looking outside my window right now at the fog and grey skies... while wrapped in a blanket. I wore a turtleneck to a dinner part last night. So not super Fourth of July-y over here. Reuben and I going to an Oakland A's game later today so maybe it's hot and sunny over on that side of the bay! This weekend has been pretty low-key so far. A lot of studying (for reuben), painting (for me), ordering Thai food, seeing various friends around the city, and eating a lot of plums. I went over to our friend's parent's house in Inner Richmond to pick up my body weight in plums. If you follow me on Instagram, you may have seen some snippets into their gorgeous backyard. I DIDN'T WANT TO LEAVE. It was so freaking beautiful and full of vegetables and fruit. I would rent a closet in that house if I could. If you closed your eyes and envisioned a classic, sunny, San Francisco home this would be it. AH. We also went to dinner at another friend's gorgeous apartment last night and now I have a huge urge to dust and organize our whole apartment. Back to the plums. I took home maybe 5+ pounds of ripe red plums. They tasted like candy. I separated them between intact plums and ones that had bursted from falling to the ground. The bursted ones have been cut up and live in plastic bags in our freezer. Sounds creepy out of context. Not that seasons really matter in San Francisco, but I like the idea of making something in the fall or winter with these sweet summer plums. If you check my browser history, you'll probably only see plum recipes. I've been researching interesting ways to showcase these plums. On my list are plum shrubs, plum sorbet, plum jam, and plum coffee cake. Oh, and this plum soda obviously! I'm in no rush to overdose on plums. They are restfully napping in the freezer until I need them. I'm just going to clarify that I am by no means an expert on drinks or cocktails. This is technically a soda... until you had your own kick to it. I have the alcohol tolerance of a child. I do love a fizzy and fruity drink though! I would drink this soda every day. I'll probably go make myself one once I finish writing this post. The plums were so sweet that I barely had to add any sugar to it. If your plums aren't quite super ripe yet, just add some more sugar to taste. This plum soda is bright, bubbly, slightly sweet, and tangy from the ginger and lime. If you don't like ginger, feel free to remove it, but it does add a nice layer to the drink and makes it taste a lot like ginger ale. It would be the perfect drink to sip on during your hot Fourth of July BBQ. It was 58 degrees yesterday and I still enjoyed it! 1. Combine ripe plums, the juice of 1 lime, ginger, and sugar into a blender or a vessel for an immersion blender. Mix for about 30-45 seconds until you have a consistent puree. 2. Add about 2 tbsp of the puree to a glass of ice. Pour 3/4 cup of sparking water into the glass. Mix with a long stirring spoon (or chopstick if you're unsophisticated like me). 3. Garnish with a sprig of basil and blackberries to be fancy! * Add a splash of gin or vodka to make it a lot more exciting! Happy first day of Summer! Happy Birthday to Momma Cho! I've always loved how those two days are the same, double the reason to celebrate! I spent about 75% of my waking hours outside in the sun this weekend, which is what everyone should be doing in preparation for summer. My shoulders were the color of tomatoes, but it was so worth it. It has been HOT in San Francisco this past week. Hot in SF = +70 degrees. My mom says it has been +90 in Ohio... we are wimps. This heat reminds me of summers in Ohio. When my brother and I were growing up at our family's restaurant we would keep cool by eat popsicles and running into our giant walk-in refrigerators. I remember walking in there and snacking on little bits of carrots and cooked roast pork. *Making a note to incorporate a walk-in fridge/freezer into the design of our future home. Sunday was picnic day. A great group of ladies and I get together for a Babes brunch every month or so and this month was a picnic edition! I look forward to these brunches so much. I love catching up with my girls and meeting the new babes that we invite each time. We found an amazing shady spot in the San Francisco Botanical Gardens to spend our afternoon. Did you know you can go in for free if your driver's license has an SF address?? Some how I did not, but now I want to go every weekend. It's gorgeous when the sun is out and it's not super crowded like Dolores Park. It's much more "civilized" than Dolores Park as well and less smells. Reuben was a little jealous of my sunny girl time so we went out for a Babes Picnic part 2 during the remaining hours of light. We drank beer and played soccer... I never play soccer. I'm feeling great from maxing out on vitamin D and my shoulders are gradually settling into a nice tan. The heat is supposed to last until this weekend and then it will go back to a cool 65. To help cool down all week I made these refreshing Peach Oolong Tea Popsicles. Yes, a second stone fruit recipe. Yes, another tea based recipe. Peaches, plums, nectarines, and pluots are really delicious right now. So eat as many as you can! If you are food nerdy and want to learn more about oolong tea, read this. I've been really interested in experimenting with tea flavors (see Mango Green Tea Popsicles and Oolong Tea Sugar Cookies). I have dreams of making a Jasmine tea cake very soon. I personally, love oolong because of it's strong and slightly caramel-y flavor. It's a pretty great replacement for coffee too if you want a rich and dark tea in the morning. It pairs beautifully with the sweetness of peaches. This makes a gorgeous peachy colored simple syrup that would be delicious in so many other recipes! I had a pop during my commute to work the other day and it was great. Breakfast popsicles should be a thing. I hope you all are keeping cool wherever you are! I need a friend with a pool. 1. Remove the pit from 2 peaches and thinly slice. Bring peaches, sugar, and 1 cup of water to a boil in a small saucepan. Boil for 5 minutes and gently crush the peaches with back of a wooden spoon to bring out that peach flavor. After 5 minutes, turn off the heat and cover with a lid. Let the peaches steep in the sugar water for 20-30 minutes. Strain the peach infused simple syrup through a fine mesh strainer and dispose of leftover peach flesh or eat it with dessert. 2. Brew your oolong tea by steeping the tea in 2 cups of boiling water for 8-10 minutes. Dispose of tea bags. In a large pitcher or measuring cup, combine tea with 3/4 c of peach simple syrup. You can add more or less depending on sweetness preference. 3. Remove the pit and thinly slice your remaining peach. 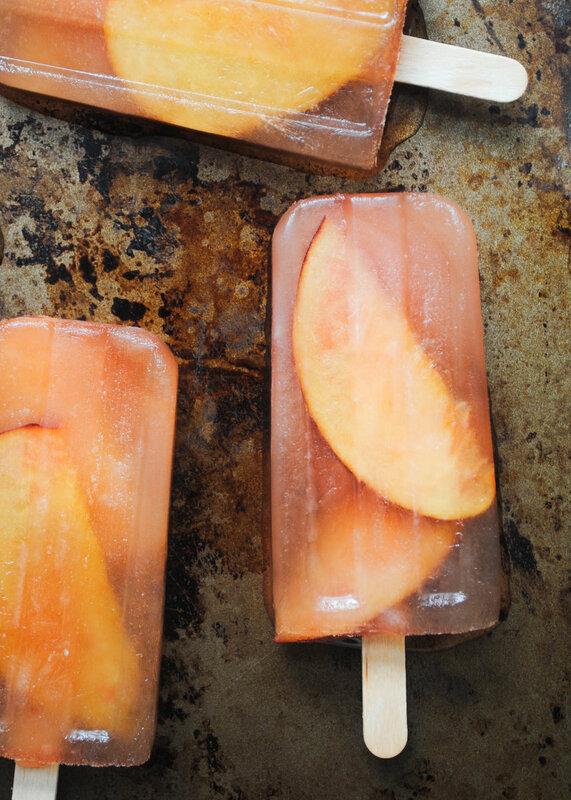 Add 2-3 slices of peach to each popsicle mold. Fill each mold with peach oolong tea. Place in the freezer for 1 hour. Add wooden popsicle sticks and place back in the freezer to fulling freeze for atleast 5 hours . Alright, alright, alright. Before I really get started with this post, I'll say it. The Cavs lost. It's very hard to be a Clevelander in San Francisco these days. I did not cry this year though! In 2015, the Warriors won. I cried and had to immediately leave the watch party I was at because it was very hard for me to process my emotions. Everyone was so happy and popping champagne and I was a sad dumpling (a soup dumpling as Reuben likes to refer to me in my sad state). Then in 2016, The Cavaliers broke the curse!!! I cried because I was so happy and full of feelings for my home state. I was yet again the only Cavs fan in the house, but it didn't matter. I was filled with so much joy! This year... I was disappointed, but mostly just "meh". I'm just ready for everyone to stop gloating. Despite the unfortunate events of Monday evening, this week has been pretty bright and sunny! For me at least, poor Reuben is working a deadline and I feel like I've barely seen him 😔 . On Tuesday I got to go to the grand opening party for the project I spent like 3 years working on at my last job. It is 2 mix-used residential buildings in San Mateo. People live in it now! And it's so so so crazy to see real people walking around the building and introducing themselves to their neighbors. It's like real live Sims!!! I was soaking up the experience and also stuffing my face with cheeseburger sliders, tuna poke, ceviche, and Tin Pot Creamery ice cream. I also stuffed my purse with some Blue Bottle iced coffee cartons. The inner old Chinese woman in me can't pass up free things. I also got to see some of my old coworkers, engineers, and contractors! Solid night. It's hard to not be in a good mood when the weather is as beautiful as it's been. I'm a Leo, and I'm probably making this up, but I feel like I am powered by the sun. My mood and energy levels are so up! Give me all the vitamin D and 70+ temperatures! This weekend Reuben and I are heading out for a long hike and some sweet time out in nature. My Babes Brunch group is also meeting up this Sunday for a picnic edition in Golden Gate Park! 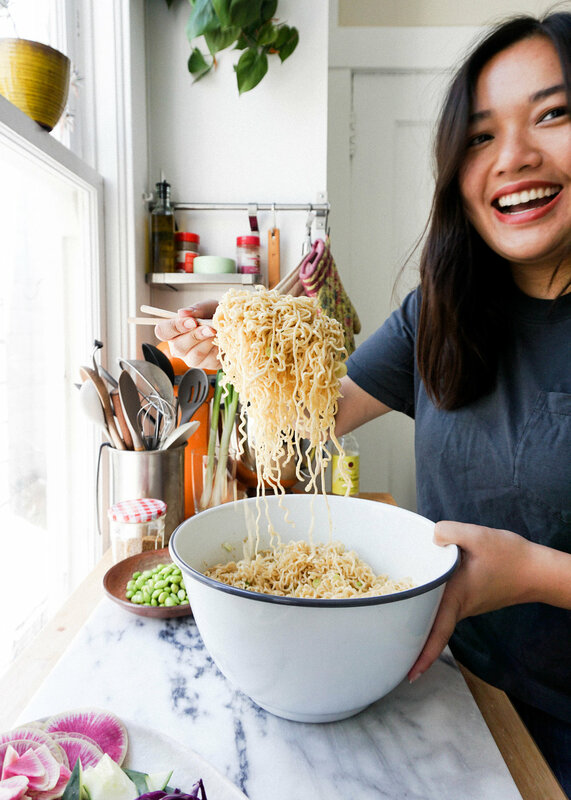 I'm making the soba noodles from my last post and I can't wait to laugh until my cheeks hurt with some babes. On a supportive girlfriend note: I'm hearing such great life updates from my girlfriends all around the world that it makes my heart burst! So it's been hard not to feel sunny this week. Should we talk about this sunny little fruit tart now? For the last couple weeks I've been seeing all the food bloggers that I envy making incredible buttercream flowers, flower cakes, flower cookies, so many flower sweets. To be honest, it intimidates me. I have very distant goals of being able to pipe buttercream roses and write "Happy Birthday Mom!" in frosting. Last weekend I had made it my goal to make a floral something. I can paint flowers with my eyes closed, so that should count for something right? I went to the Clement Street Farmers Market, as I do every week, and picked some sweet plums and peaches for a tart. I brought them home and took a deep breath. Am I being dramatic? 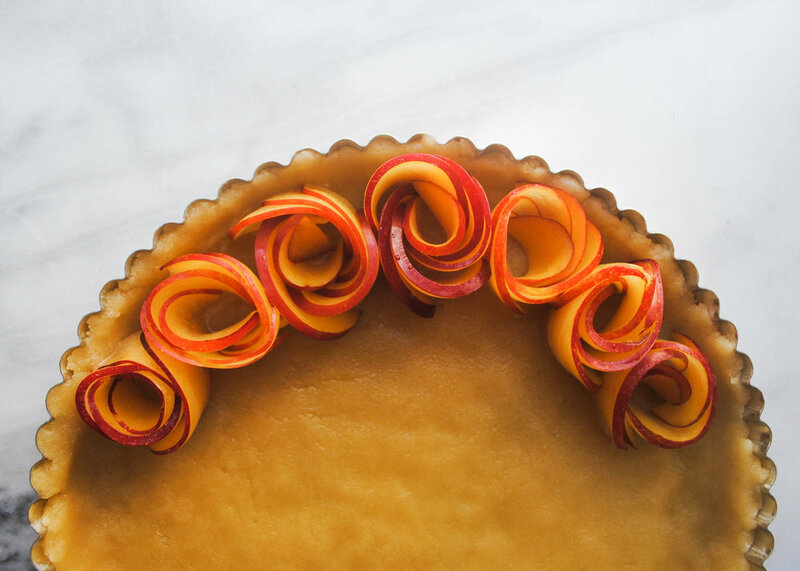 Turns out, this floral tart is really not that hard. If you have a sharp knife and a peaceful mind, making these fruit roses was actually quite relaxing. This fruit tart is such a pretty and delicious dessert. It's sweet and brightly acidic. I won't tell anyone if you add a scoop of vanilla ice cream too. It sort of looks like a pepperoni pizza though in the post oven pictures, doesn't it? I noticed while I was editing the photos and now I can't un-see it lol. Eh, I ain't mad about that. 1. In a mixing bowl, stir together 1 1/2 cups flour, 1/2 teaspoon salt and 1 teaspoon sugar. In a small bowl, whisk together the oils, milk and almond extract. Pour this mixture into the flour mixture and mix gently with a fork, just until it starts to come together. Then, transfer the dough to an 11-inch tart pan. Use your hands to pat out the dough so it covers the bottom of the pan, pushing it up the sides to meet the edge. 2. In a small bowl, combine 3/4 cup sugar, 2 tablespoons flour, 1/4 teaspoon salt and the butter. Using your fingers, pinch the butter into the dry ingredients until crumbly, with a mixture of fine granules and tiny pebbles. Set aside. 3. Preheat your oven to 425 degrees. 4. Cut and pit your stone fruit of choice. Make sure to maintain either quarter or half segments of your fruit. Cut into thin slices, about 1/16 to 1/8 of an inch. You don't want them paper thin because they need structure to maintain the rose shape. Keep your slices in segments, this will make forming the roses easier. You can get about 2 small roses out of a 1/4 segment. Take a few adjacent slices and gently pinch them into a long segment, make sure the slices are still touching. Then slowly curl on end of the slices and form a rose. Place in your tart dough and gently push down to keep it in place. Repeat until the tart is full. Alternatively, you could also lay out the slices into whatever pattern your heart desires! 5. 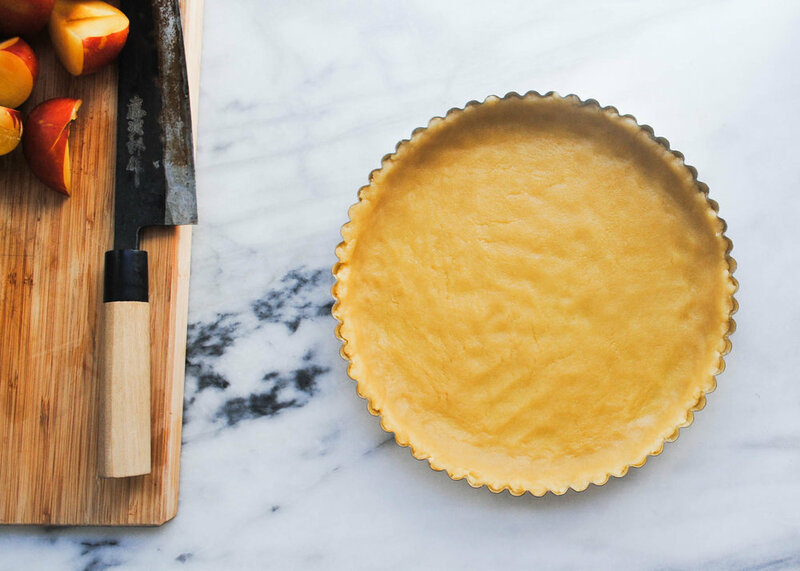 Once the tart is full of fruit, sprinkle your sugar mixture over the fruit. Take in the oven and bake for 35-40 minutes, until the crust is slightly brown and the fruit is juicy. Allow to cool on a cooling rack and enjoy!